These days I feel like I have a paint brush and roller glued to my hands...oh, what I wouldn't give for bionic painting hands! I'm hard at work putting the finishing touches on our mudroom/kitchen reno and if that wasn't enough I decided to paint the exterior in my downtime. Why did I decide to take on two massive projects at once? Well, I'm crazy....and impatient. Plus, I picked up my Clark + Kensington paint a few weeks back (in Ace Hardware's Seal Point) and it's been calling me from the shed ever since. Exterior Paint "Seal Point" by Ace Hardware - Progress...still have trim and a few walls to finish. Ace Hardware offered me the opportunity to try out their new line of premium paint - Clark + Kensington. Picking the project was easy - the paint color, that was another story. Choosing paint colors is a daunting task. 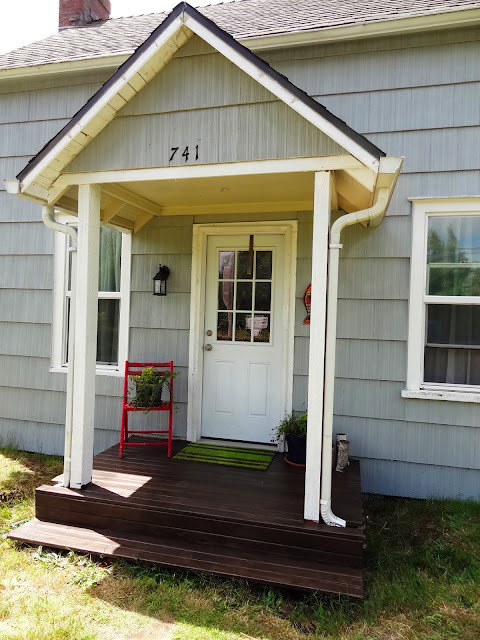 It's one thing to make the wrong decision and have to repaint (like I did here), but it's a whole 'nother problem when it's a huge project like the exterior of your house. Knowing what will work for your home and style and making the right decision will save you time, money and a few gray hairs. 1) Know Your Home - Take into account the style of your home and landscaping and any aspects of your home that can't be painted, like brick or stonework - and plan your color scheme around those. 2) Find Inspiration - Whether it's on your daily commute or a late-night Pinterest binge, find houses that you admire. 1) Grab as many paint chips or paint decks as possible from all different brands. Test the paint chips out in daylight and against your home's exterior. 3) For the chips that have made the first cut, have paint samples made and paint a section of your home. I prefer to paint a large section so I can get a good feel for the color. 4) Be patient - take the time to see the paint in different lighting situations, i.e. full daylight, shade, cloud, dusk, etc. 5) Go with your gut - if you're leaning towards one color, go with it. You know what you like. 6) Call in the pros - A color consultation with a design professional, like my friend Michelle, can save you the headache of choosing a single color, let alone a whole color palette. For more tips on how to pick paint colors for the exterior of your home check out these ideabooks from Houzz which range from choosing specific colors to how to get the color right or this helpful guide from Ace Hardware.